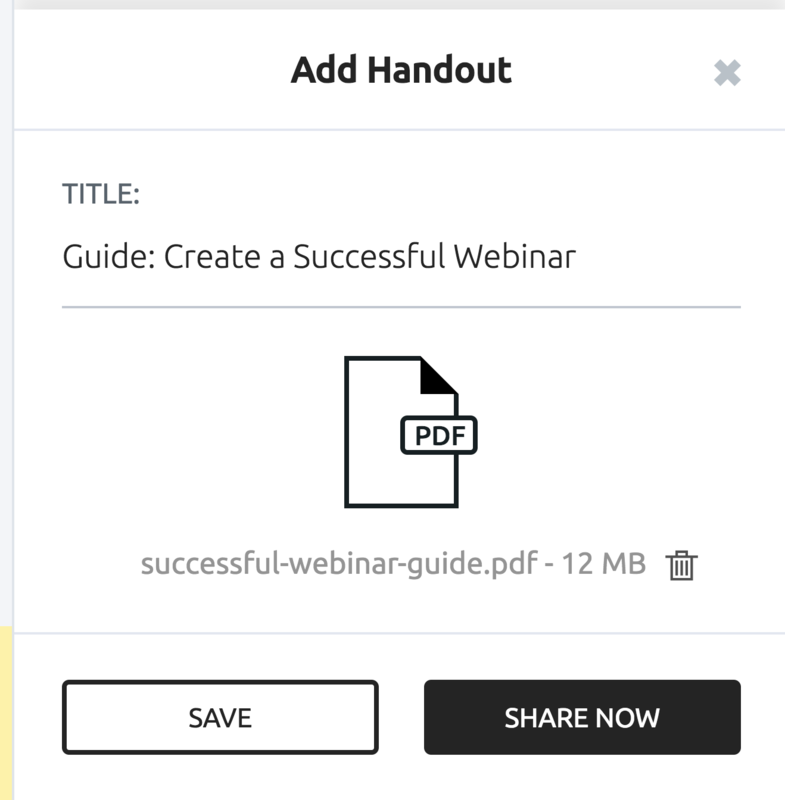 Learn how to share files directly with Attendees. With our Handouts feature, any Hosts/Coordinators can share files directly with their Attendees! Any type of file ranging up to 500 MB can be shared (exception on .exe file types). From your Chat Box on the right, you'll want to select the plus symbol (+) located near the message box. Doing so will showcase a few options, including the option to set up a Handout. 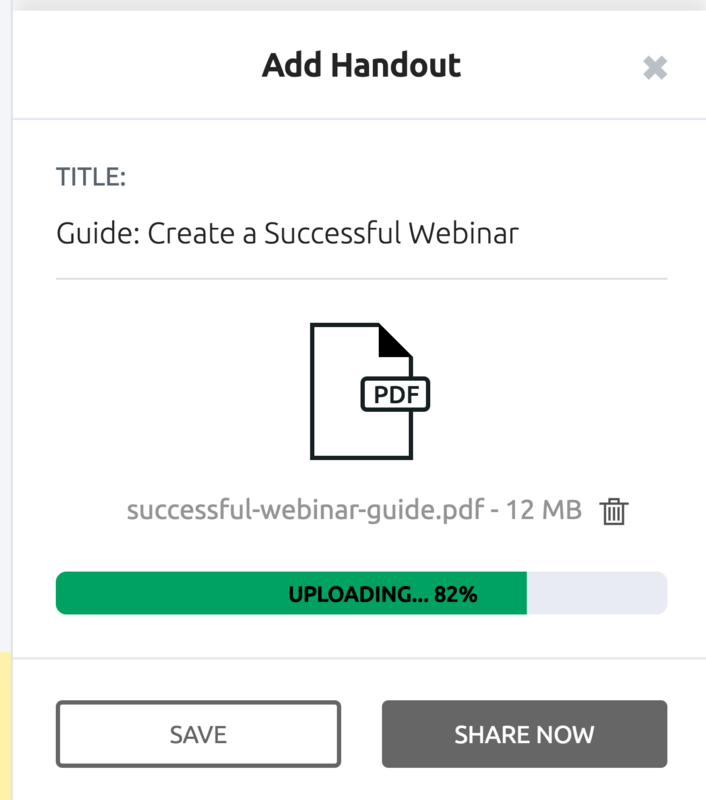 You'll be shown the Add Handout window, with the option to add a file—you can browse to the file or drag-and-drop the file directly! Once added, you'll see the file upload! During this time, you can also give your Handout a Title—Attendees will see this as the name of the Handout when it is shared. Once you're Handout is uploaded and you're happy with how every thing looks, you can choose one of two options! Save: this allows you to save your newly created Handout to share it later. Saving a Handout will add it as an Existing action when you select the plus symbol (+) located near the message box. This is a great option for allowing you to create Handouts ahead of time. Now that you have the Handout set up, it's pretty easy to share! If you've had saved the Handout while setting it up, selecting the Handout from the Existing Actions will prompt you before sharing it. 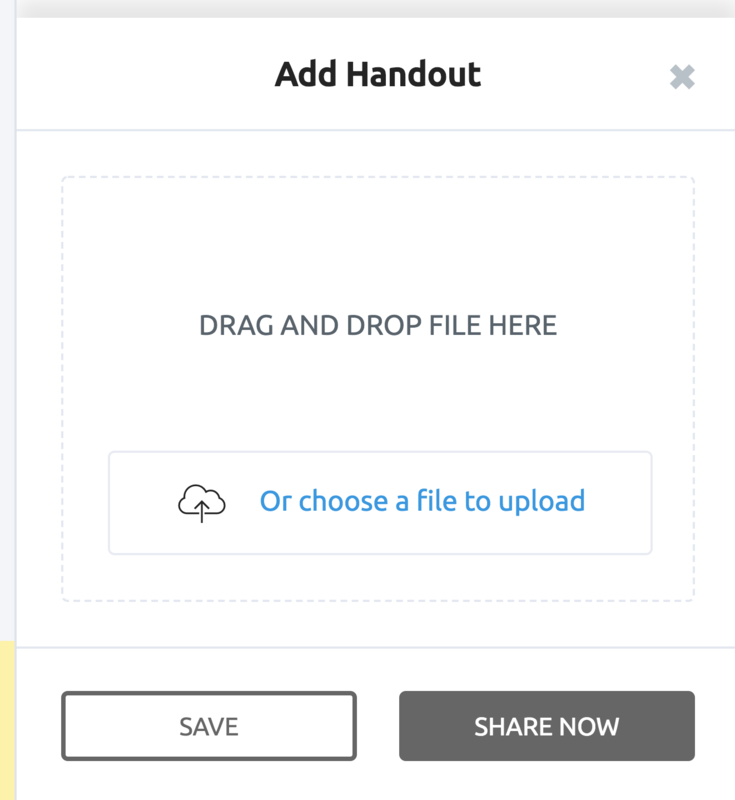 When you select the Share Now option, it'll share it immediately! 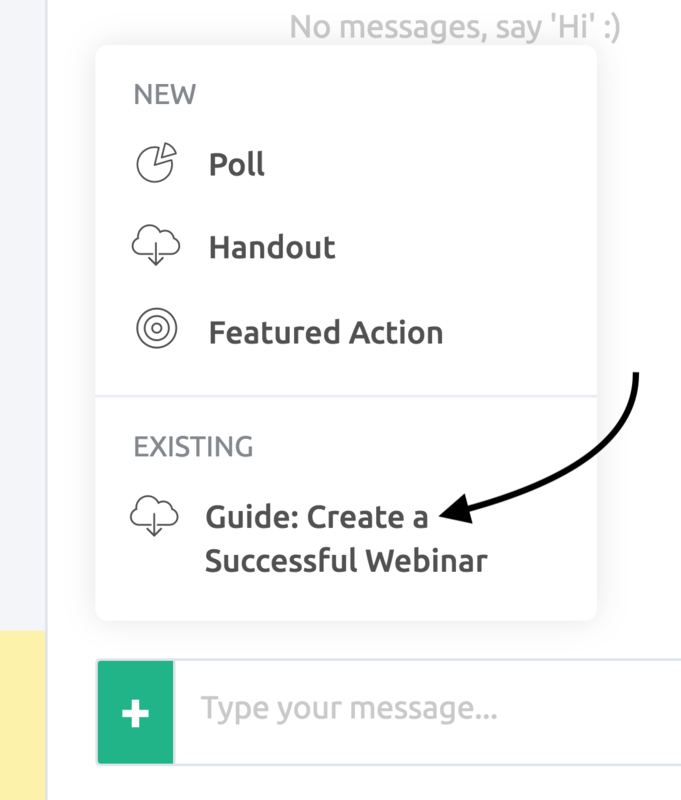 Once you've shared the Handout, it'll appear directly above the chat, with a few options! First, you'll find a small toggle-icon located at the top, allowing Attendees to show/hide the pop-up. On the pop-up itself, it'll showcase the Title you gave it during the setup, a few details about the file including the file type and size, as well as the option to Download the file (or Hide it). 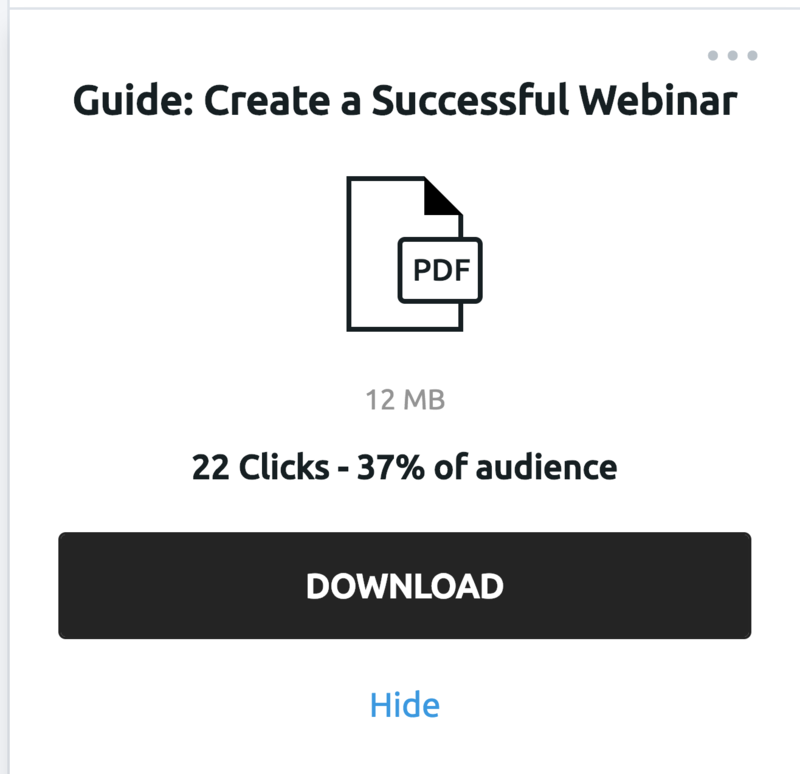 For any Hosts/Coordinators, it will also show the number of times it's been clicked (which relates to the number of downloads), including the percentage of Attendees that have downloaded it. 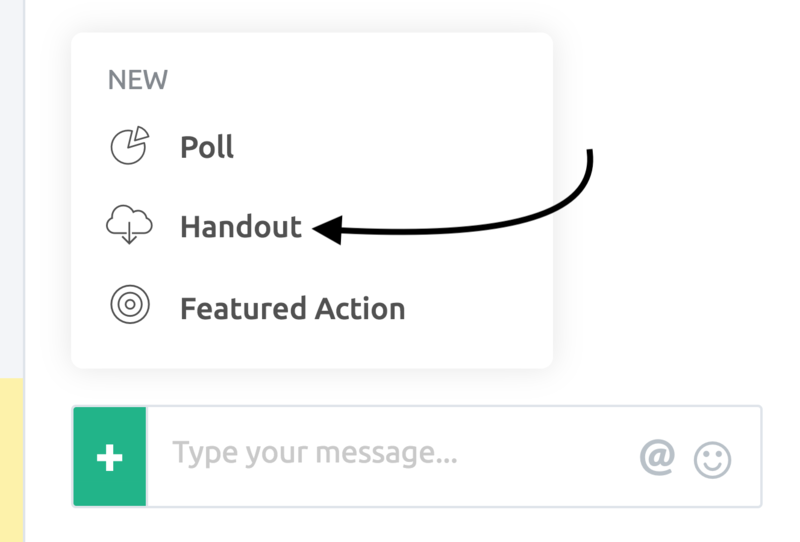 When a Handout is shared, it'll also add it as a message directly in the Chat Box as well! 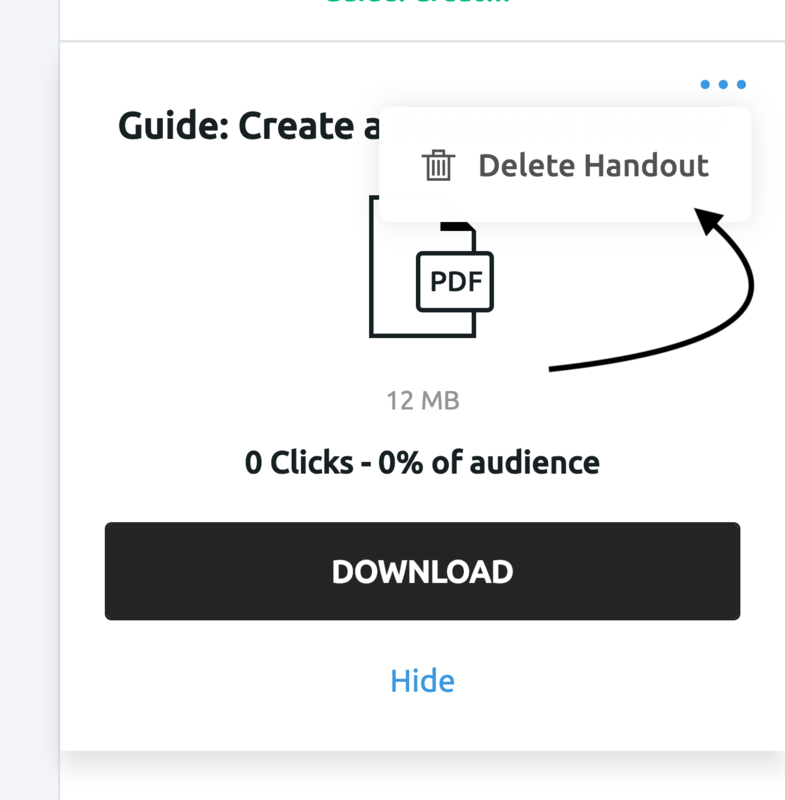 You can also delete a Handout after it has been shared. To do so, simply toggle your Handout then select the More Options (three dots) located at the top-right. You'll see the option to Delete Handout, which will prompt you then proceed with removing the Handout from your event. Just keep in mind that once you delete the Handout, you will have to set it up again. Note: Deleting the Handout will not remove the Chat Message that was previously added—you may want to remove that message manually as well!